Wednesday, March 28, 1979, 4:00 a.m. to 9:00 a.m. Figure 3.1. The accident at TMI-2, as summarized in a schematic drawing by Randy Yeip for the Harrisburg Patriot-News. 4:00 a.m. Operators trying to unclog some piping in the secondary (steam generating) water circulation system accidentally block the flow of water, stopping removal of heat from the reactor. 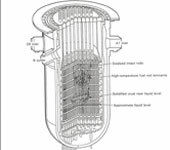 Within ten seconds, all of the following events occur: The cooling water filling the reactor vessel, heated by the core, gets hotter and its pressure rises. A relief valve at the top of the pressurizer tank—the so-called pilot-operated relief valve (PORV)—opens automatically; steam escapes. But the temperature and pressure of the water in the primary system continue to rise because heat generated by uranium fission in the reactor’s core is no longer being removed from the reactor cooling water in the steam generator. 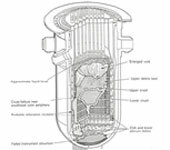 Automatically, the control rods are thrust down into the reactor. The nuclear fission chain reaction in the uranium fuel is stopped, completely. The PORV relief valve should now close automatically, and the indicator light in the control room says that it is closed. But in fact the valve is stuck open. 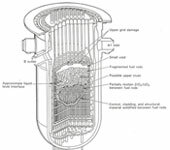 4:02 a.m. With the PORV relief valve stuck open, the pressure in the “head” of steam at the top of the pressurizer tank drops, allowing water in the pressurizer tank to boil violently and stream out through the open valve. The reactor is losing its cooling water. Figure 3.2. Although this photo suggests the confusion and consternation that reigned in the TMI-2 control room early Wednesday morning, it was made later, probably on Friday or Saturday. 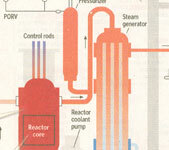 The fall in pressure says “leak” to the automatic controls, which turn on pumps to inject more water into the reactor. The operators, not knowing that the PORV relief valve is stuck open and that water is escaping through it from the reactor—and remembering earlier occasions when these emergency pumps had come on without reason—see no reason to add water. On the contrary, the violently boiling water creates the appearance of the pressurizer becoming filled with water, a condition that the operators have been trained to prevent. The operators therefore turn off the pumps. This is a serious mistake. Although the production of heat by nuclear fission is stopped completely by the insertion of the control rods, the radioactivity created in the fuel during months of operation of the reactor continues to generate lots of heat— 160 megawatts of heat immediately after the control rods go in, then falling over the first hour to 30 megawatts, and over the next three hours to 20 megawatts (ref. 29, v. 2, pp. 311, 494-97). 4:05 - 6:00 a.m. The water in the reactor boils away, leaving more and more of the reactor’s fuel “high and dry.” The operators disbelieve the various indications of serious trouble (including rising levels of radiation in the reactor buildings). 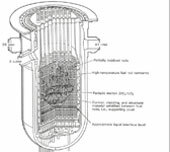 Lacking any direct indicator of the water level in the reactor, they fail to grasp what is happening: the uranium fuel, intensely hot, is reacting chemically with the zirconium tubing from the inside, while superheated steam is reacting chemically with the zirconium from the outside. The fuel rods are rupturing. 6:18 a.m. Finally recognizing that the PORV relief valve could be open, the operators close a manual back-up valve. But it is another hour before it occurs to them that if the relief valve was open all this while, then the reactor could be running short of water. 7:20 a.m. Pumps are turned on to inject water into the reactor. The core is finally bathed again in cooling water, but the water cannot penetrate the mass of collapsed and melted fuel rods. This dense conglomerate continues to heat itself up. 7:45 a.m. By now there are at least 20, perhaps as many as 60, operators, supervisors, and other persons in the control room. Although none is yet ready to believe that the core had been uncovered, radiation levels in the power plant buildings are so high that Nuclear Regulatory Commission regulations require the declaration of a general emergency. While state and federal officials are being informed of elevated radiation levels, unbeknown to all, a molten mass of metal and fuel—some twenty tons in all—is spilling into the bottom of the reactor vessel. 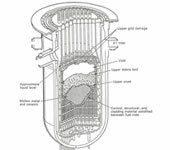 The bottom of the reactor vessel is steel, five inches (13 cm) thick. But even that thickness of steel would not be expected to hold up for more than a few hours against such heat. If this meltdown were known, or even merely surmised, drastic emergency measures, including evacuation of the region for miles around, would certainly be ordered by the governor. 9:00 a.m. The reactor vessel holds firm, and the molten uranium, immersed in water, now gradually begins to cool. The real danger is past without anyone knowing how great it had been. The condition of the reactor’s core over the course of the crucial hour of the accident: at two and a half hours (150 minutes) after the 4:00 a.m. start of the accident; at 173 minutes; at 174 minutes; at 224 minutes; at 225 minutes. Source of images: INEEL, reproduced from ref.4. Figure 3.3. The condition of the reactor’s core at 150 minutes. Figure 3.4. The condition of the reactor’s core at 173 minutes. Figure 3.5. The condition of the reactor’s core at 174 minutes. Figure 3.6. The condition of the reactor’s core at 224 minutes. Figure 3.7. The condition of the reactor’s core at 225 minutes. More detailed narratives of the course of the accident are given in ref. 29 and 30.